The Pilates Ring is a great, portable exercise tool. With its large and ergonomic handles and the completely paddedsurface, the lightweight fiberglass ring offers a comfortable, soft, and securegrip. Use it to tone your arms, chest, hips and thighs. What is the Pilates Ring? 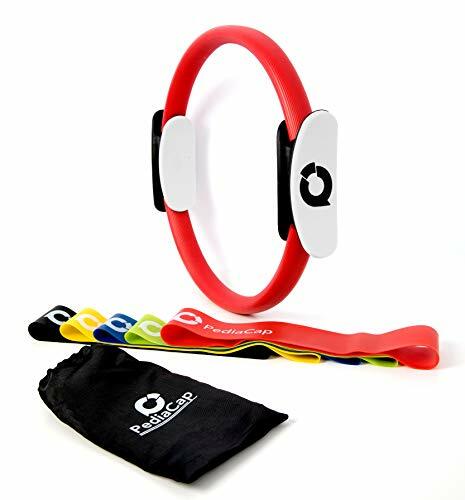 ThePilates Ring by Pediacap is a doubled handle ring for use during pilates andflexibility training. Featuring an inner and outer gripping section, the ringis perfect for strengthening, flexibility and toning exercises. Equally usefulduring yoga, pilates and even standard strength or core training exercises. The Pilates Ring is ideal for floor based and standingexercises which engage the core and supporting muscles of the spine. Utilisingthe body's own weight and capable of usage by just about anyone, thelightweight ring features inner and outer grips for total comfort. Perfectlysuited to leg exercises, pelvic floor routines and upper body work, the PilatesRing by Pediacap will transform your flexibility training and strengthen thecore. The diameter of the ring is 13 inch. If you have any questions about this product by Pediacap, contact us by completing and submitting the form below. If you are looking for a specif part number, please include it with your message. Toning Ring for Pilates and Contraction Exercises for Thighs, Hip, Waist, Abs, and More.